At least, more of them than usual might. A young woman registers to vote. The question on many Democrats’ minds is: Will young people turn out to vote in 2018? Recent survey data has liberals worried. In particular, a recent Gallup poll found that only 26 percent of American adults age 18 to 291 said they were “absolutely certain to vote.” Meanwhile, the Public Religion Research Institute found that 35 percent of young people said they were certain to vote, but it was still fewer than the 38 percent who said they would vote in the last midterm election in 2014. On the face of it, this sounds like pretty low voter turnout. But you have to remember in a midterm, turnout is already depressed — usually around 40 percent of all voters compared to the roughly 60 percent who generally vote in a presidential election. 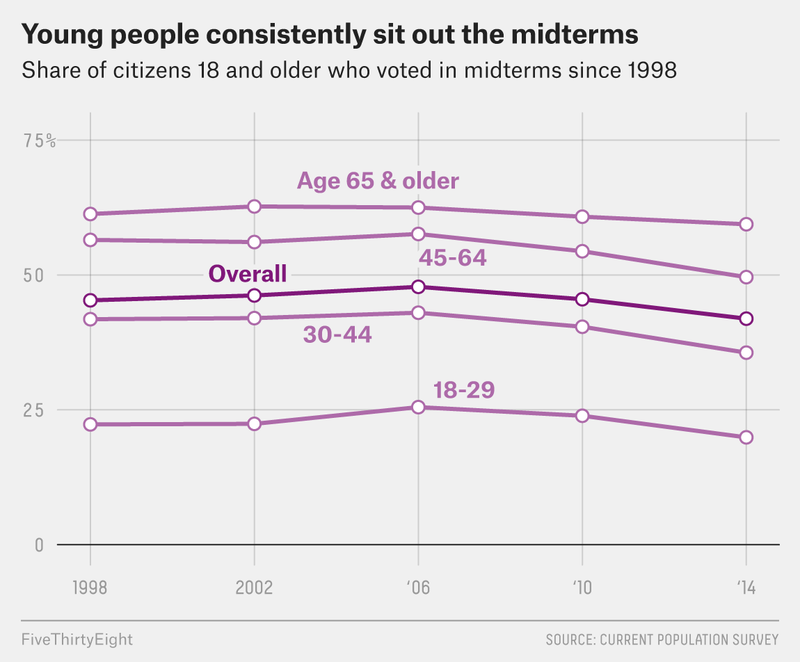 The midterm electorate is also generally older and whiter than it is in presidential years, which has sparked Democratic concern that young voters, who predominantly identify as Democrats and who backed Hillary Clinton by around 20 percentage points in 2016, won’t show up to vote. But other data I looked at suggests that this fear might be misguided and that turnout among the 18-to-29 group could be way up in 2018. Before we jump into this other data, let’s first look at young voter turnout in midterms from 1998 to 2014 to provide context for what we might see in 2018. While turnout in 2014 was down across the board — the lowest overall rate since the 1942 midterm — turnout among 18- to 29-year-olds was particularly measly at 20 percent. It was the lowest turnout for that group in the past 20 years. Polling from the Harvard Kennedy School’s Institute of Politics also gives us reason to believe we may see high turnout from young voters. The institute conducts a long-running, large-sample poll of young Americans, and it has specifically surveyed 18- to 29-year-olds since 2009. Previously, 34 percent was the high mark for those who said they “definitely” would be voting in a midterm election, which the institute found in its fall 2013 survey. But in the IOP’s spring 2018 poll, 37 percent of 18- to 29-year-olds answered they would “definitely” vote, which was a new record high. While IOP’s fall 2018 poll won’t come out until the end of October, John Della Volpe, director of polling at IOP, told me that a new poll conducted by his company, Social Sphere,6 found that 34 percent of 18- to 29-year-olds said they would “definitely” vote, which is similar to the 37 percent finding in this spring’s IOP poll. This is substantially higher than what Gallup reported, and higher than what the IOP found in its fall polls conducted immediately before the 2010 and 2014 midterms — 27 percent and 26 percent, respectively — which suggests young voters could turn out at a relatively high rate this November. IOP’s polling of 18- to 29-year-olds only covers three midterm cycles including this one, so we should not exaggerate this evidence. But taken with the data from CIRCLE, another organization that closely monitors the political intentions of young people, these poll numbers are notable. It’s not certain that young voters will turn out at a higher-than-usual rate in 2018, but data does suggest it’s possible. And if young people do turn out at an unusually high rate, it will be hard not to give President Trump much of the credit. After all, IOP’s spring 2018 poll found that 72 percent of 18- to 29-year-olds disapproved of the president and 58 percent preferred that the Democrats take control Congress in November. So combining the Democratic lean of younger voters with the perceived enthusiasm advantage of Democrats over Republicans in this year’s midterm, it makes sense that we might see greater participation by young voters in a Democratic-leaning electoral environment. This age range is commonly used to classify young voters in surveys and exit polls. Since 1964, the CPS has collected data on voting and registration in every federal election year. Like other voting behavior surveys, the CPS tends to over-report voter participation, but it’s still one of the best data sets on the topic. The CPS gives data on the citizen voting-age population — that is, all citizens over 18 — but it does not provide data on the voting-eligible population, which is a narrower category that excludes disenfranchised felons and people in institutions such as prison and some types of health care facilities. The same is true in presidential elections, though the difference is less disproportionate. Note that exit polls have limitations and sometimes exaggerate or underestimate demographic groups’ electoral participation rates. The poll was fielded by NORC AmeriSpeaks.